I have a lot more post subjects to write about in Chicago, but I’m going to add in a few from our Traverse City jaunt in between, so the blog isn’t all Chicago all the time. Don’t worry, I have plenty more topics from both trips that should last at least until we go somewhere else 🙂 I’ve been collecting posts as we wander around the U.P., as well. So here’s a peek at one of the discoveries we made down in the northern Lower Peninsula of Michigan. On our recent weekend trip to Traverse City and environs, we had the pleasure of a lazy, rainy drive through the Leelanau Peninsula wine country. Of course, that was the reason for the business trip: To get more familiar with vintners, chefs and others in the TC area, because one of the publications we work for, Northwest Michigan Second Wave, covers a lot of things happening in those fields, and of interest to those in the food and wine business. If you have ever been to Traverse City, you know food and wine is a major pastime there, and heck, you probably know that even if you haven’t been there. It appears that fascination with food extends up the more rural and agricultural Leelanau, as we were looking for a nice place to breakfast before heading out to wineries, and found the somewhat aptly named Cedar Rustic Inn, in Cedar. Now, Cedar itself is a nice, very small town, with not much more than a few stores, the inn, and a sprinkling of houses before the countryside gives way to farms and orchards again. 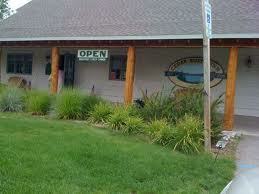 The Cedar Rustic Inn opened in 2006 and was a great stop to eat on the Leelanau Peninsula. The Cedar Rustic Inn is right next to the Longview Winery tasting room, and serves breakfast, lunch and dinner for those passing through, perhaps on a wine tour. From the photos in the foyer, the restaurant has been the subject of quite a restoration project, having opened in 2006. In past lives, it’s been a roadhouse, a foundry, a gas station, and a pool hall. Now, it’s run by Chef Aaron Ackley and his wife, Nikki. We were greeted with friendly service and good coffee, and decided on a late breakfast of pretty traditional fare; bacon, eggs, potatoes, corned beef hash, et al. We were told the breakfast sausage comes from Cedar’s own butcher shop, Pleva Meats, and it certainly lived up to its reputation. Examining the menus for lunch and dinner showed that the prices are pretty nice all day, which isn’t always what you get in a heavily tourism-centric area, so that was good to see. The dinner menu departs a little from traditional American fare, bringing in more global influences, but sticking with coastal Michigan favorites of seafood, fresh fish and local ingredients. We’ll be visiting the area again this summer, so do you have any other breakfast, lunch or dinner recommendations? We know there are lots of great places near Traverse City to eat! Enter your email address to subscribe to There and Back Again.